I start every new hospice patient interaction with a hello. I introduce myself and then ask for permission to sit and visit. It is not uncommon for the patient to start off on guard, wary. By the time patients meet me, they have been through a lot of medical interactions. They have been asked a lot of questions. I tell them I have just one question. I sometimes notice an exhale. Whew. She’s not going to grill me. The answer to this question will lead you to have a greater understanding of the needs, desires and identity of the person beyond their being a “patient.” There is no wrong answer to this question, despite what family members might think. 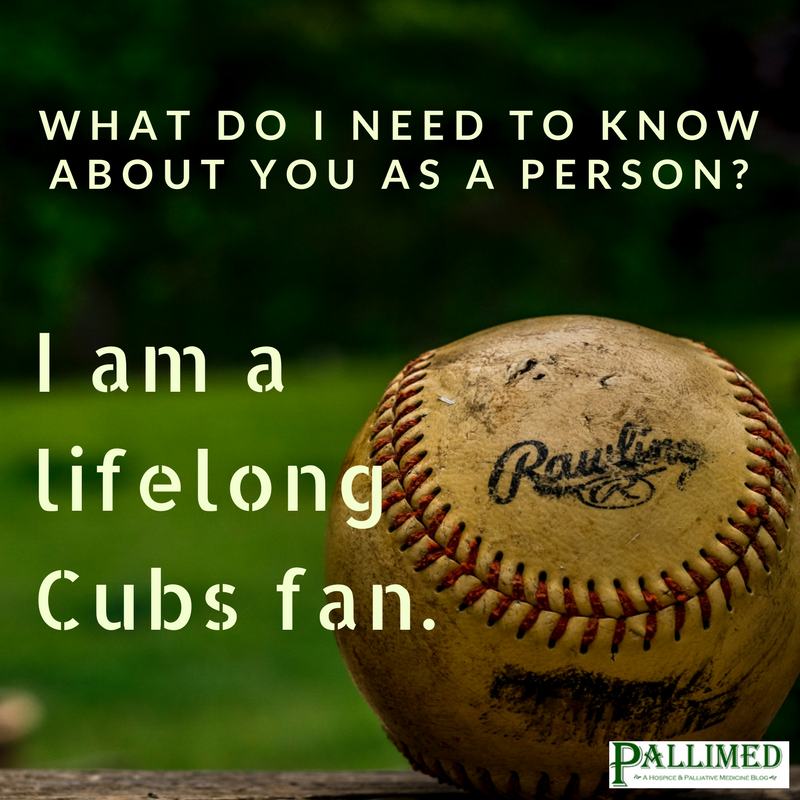 The nurse, chaplain and I made small talk with the patient for a few minutes about baseball, The Cubs, and a broken curse. What we weren’t doing was talking about his illness. He was sick of talking about his symptoms, his diagnosis, how he was feeling. For once, he wanted to feel normal. The answers to “the dignity question” as I call it, are varied, but always telling. The patient who told me, “I love my husband” would eat when she wasn’t hungry just to appease him. 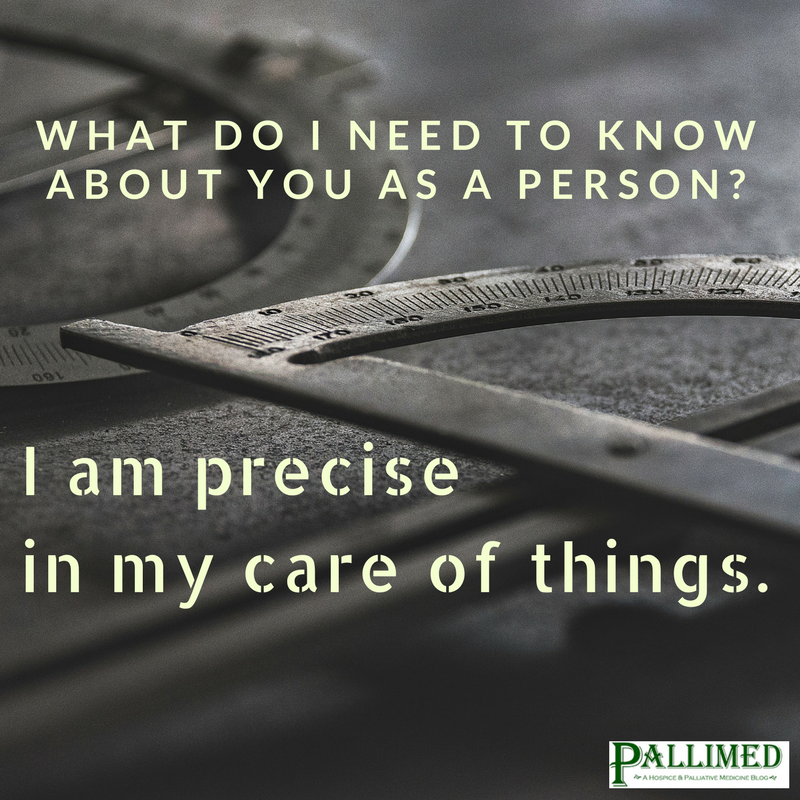 The patient who said, “I’m precise in my care of things” wanted to know the details of every medication that was being administered. The patient who said, “I am a good person. I try to help people” worried that every request was an imposition. I have heard more than one patient say, “I am crazy.” It is their way of sharing that they have a certain approach to life, and they want to keep the conversation light. Sometimes the patient does not want to answer the question. They will say, “I don’t know.” Depending on their tone, I might ask, “Would it be safe to say you are a private person?” If they acknowledge that they are private, then I tell them it’s good for me to know that. I explain to them that as their social worker, my number one job is to advocate for them. I tell them I will let others know they don’t want a lot of questions. Not surprisingly, when I give them “permission” to be private, they often do open up to me. 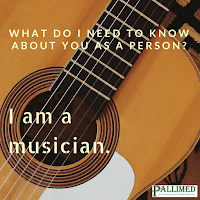 If a patient says, “I don’t know” because they are not introspective or don’t like talking about themselves, I’ll ask if they are okay with me asking their family. This opens up an interesting dialogue where the family shares about the patient in front of them. I will usually ask the patient if they agree with what their family member said. A daughter once said, “She’s cranky” and suddenly the quiet patient retorted, “look who’s talking!” and they got into a friendly banter. Families don’t always know how the patient would answer. Whenever possible, get the answer directly from the patient. A patient who was described as “family oriented” later woke up to define himself differently. 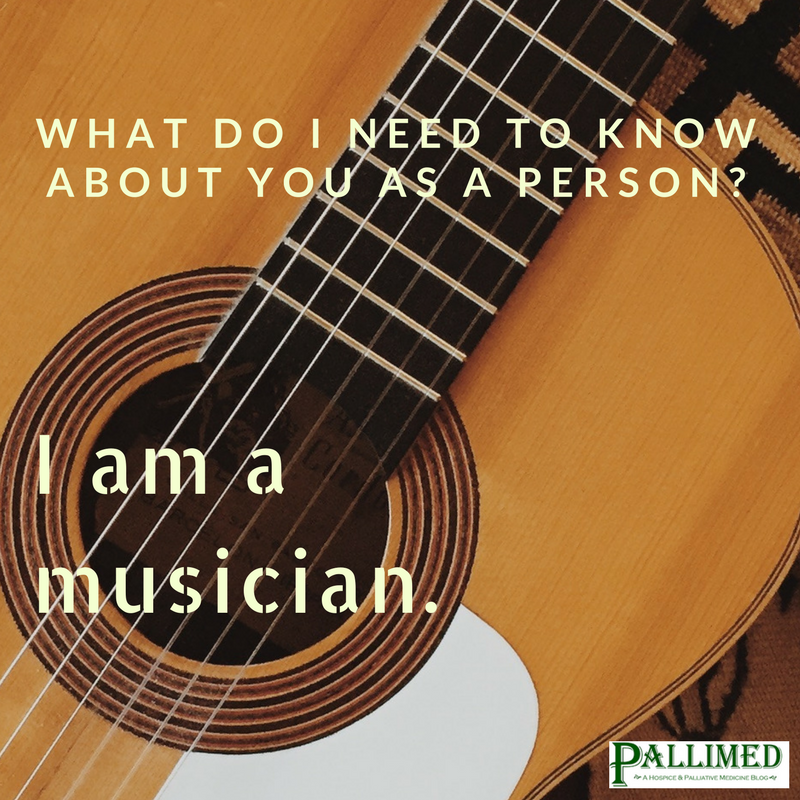 “I am a musician,” he said. There are times when a patient comes onto hospice minimally responsive and not able to answer for themselves. The family members’ responses to the dignity question can still be helpful. I had one spouse who told me that her husband was extraordinarily modest. He didn’t even like to change clothes in front of her. That week, I went to the house when he was actively dying and I noted there were at least 15 people wandering in and out of the room. I provided as much support as I could, and once I was certain symptoms were under control and family felt confident in providing care, I started to say goodbye. I sat down with the wife on the porch. “Do you remember when you said your husband was modest?” I asked. I agreed and suggested that he might be hanging on until he had privacy. I told her I knew it was a delicate situation because other family needed to say goodbye, and I would leave it up to her to figure out the best way to clear the room. She reported later that she was able to encourage people to give him privacy, and he died that evening with just her by his side. How do you see yourself? How would you answer the question? How would your loved ones describe you? I told my husband about the dignity question one evening after work. I said,” I would like to think I’m happy-go-lucky.” He laughed loudly (perhaps snorted) and told me I was most definitely NOT a carefree person. I sometimes share this story with families as a way to encourage them to imagine what the patient would want me to know (if the patient can’t speak for themselves). The question itself appears to be therapeutic as loved ones speculate how the patient would describe themselves. 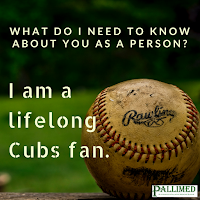 If multiple loved ones are in the room together, I give everyone the opportunity to answer the question and you learn about the patient and their relationship. 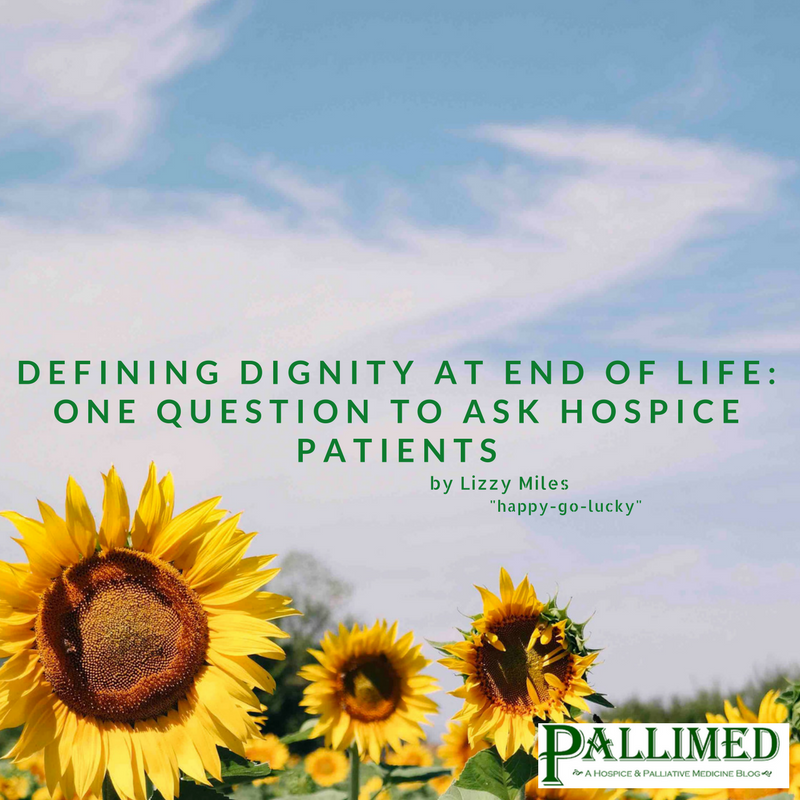 The way that patients define dignity is unique to the individual. If you are not familiar with Dignity In Care research, I would highly recommend the Dignity In Care website which has information on research effectiveness and an additional toolkit of questions to further explore patient needs. Lizzy Miles, MA, MSW, LSW is still trying to figure out how she needs to project a happy-go-lucky vibe. She is a hospice social worker in Columbus, Ohio and regular contributor to Pallimed.org. Lizzy authored a book of happy hospice stories: Somewhere In Between: The Hokey Pokey, Chocolate Cake and the Shared Death Experience. Lizzy is best known for bringing the Death Cafe concept to the United States. You can find her on Twitter @LizzyMiles_MSW.